WordParts’ educational products provide a new paradigm in learning English language structure. Students using WordParts will find components suited to their primary learning style as it is a multi-media kit with lesson presentations designed for the seven learning styles. 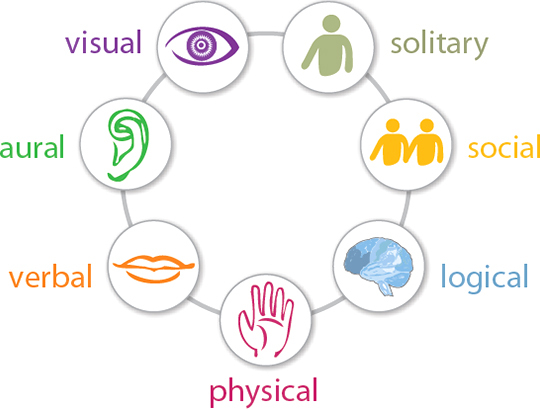 Verbal Curriculum includes dramatic scenarios, games, and group activities. Aural Musical CD’s are provided with simple parts of speech songs. These can be played anywhere a student is to reinforce their learning. Visual Dramatic visuals are employed in every aspect of our product, be it colorful shapes, visual aids for the classroom, or animated graphical images in the software. Solitary Student software applications reinforce what has been learned as children work independently. Social Role-playing collaboration, and even “movie-making” techniques are included to create an interactive learning environment. Logical Lessons included are reasons for the content, stimulating the logical mind. By using illogical and irrational association, the logical thinker’s curiosity is honed. Physical An important tier is the use of 3D shapes that students see, feel, touch, and manipulate during their activities. 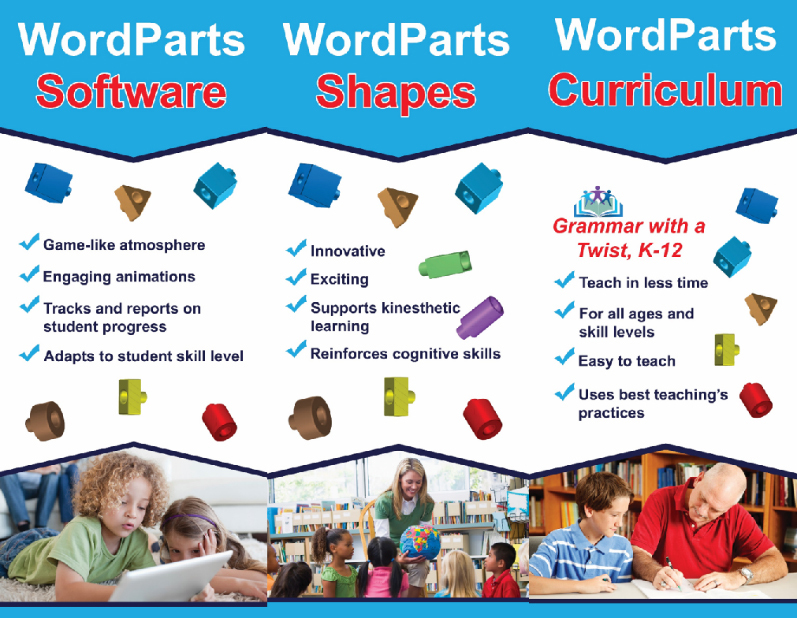 The three pillars of WordParts – Curriculum, Shapes and Software – combine to deliver a unique learning environment. GRAMMAR with a TWIST makes English grammar (curriculum) easy to teach in a minimal amount of time and uses best teaching practices. The innovative, exciting shapes support kinesthetic learning and reinforce cognitive skills. The software provides a game-like atmosphere with engaging animations, while adapting to each student’s skill level. Numerous studies show that 21st century needs are for effective collaborators and communicators in virtually every situation. Yet these same studies show a deficiency when it comes to achieving these skills. We believe our educational resources will make teachers, parents, and students more effective as they teach and learn English grammar. And if you want more convincing, find out more about us, check to see what products we have available today, or sample our software, curriculum, or shapes. WordParts is a product that helps children learn to communicate and collaborate effectively. Designed to model the common “I do, We do, You do” teaching model, WordParts provides curriculum, physical shapes and software that teachers and parents can use to teach children parts of speech, sentence structure, and how to improve writing. We have tailored WordParts for the audiences (over 44 Million students) we service. View our product plan!